I haven’t come across very many people in my life who can truly walk the walk and talk the talk, especially in the world of animal rescue and veganism. That is, until I met Mike and Wendy Stura. Last summer, I moved to Connecticut and began to frequent a local farm – one that raised chickens, goats, and provided fresh produce and beautiful plants. I enjoyed visiting with Daisy, their baby goat, who seemed to have a good enough life – she got daily visits, pets, and hugs, and was fed a good diet. One day, while my mom and I were paying the farm a visit, I went to pay the older goats a visit. When I passed by their pen, I discovered what looked like a large, white doghouse. He started to nurse on my mom’s and my coats and to nuzzle against us, starved for affection. Clearly sick – diarrhea stuck to his little bottom – and not thriving, we wondered what the heck his fate would be on a small farm like this, one that was clearly not set up to handle livestock. When we asked the owner of the farm, he told us that he had purchased the calf to help attract families to the diabetes fundraiser his farm was sponsoring. When my mom asked what he planned to do with the calf, he shrugged as if to say, “I don’t know” in a way that felt to us like he didn’t really care. We knew that we had to do something. There was no way we could drive past this place every day and know that this little baby boy was either there, suffering and sick, or on his way to the slaughterhouse. Male baby cows are seen as castoffs in the dairy industry, so his fate did not look very bright. 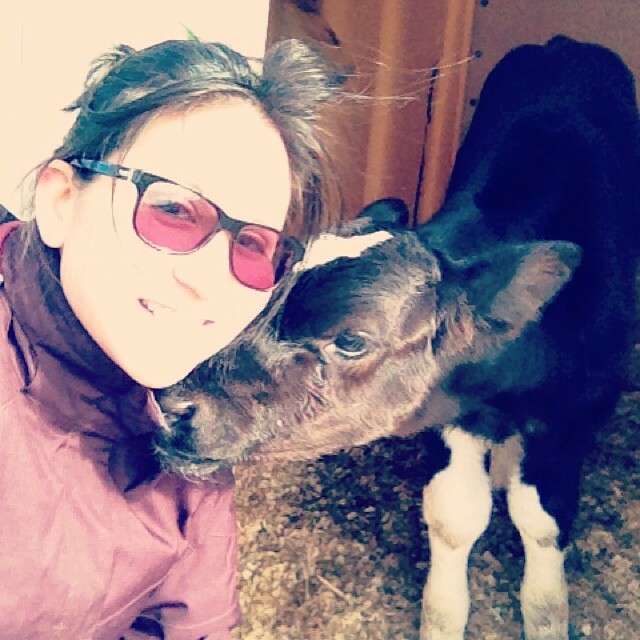 The little boy had only been with his mother for a day before he was taken away and sold at auction – he didn’t have nearly enough colostrum in his system, which is why he developed what looked to me like a huge abscess on his knee. Holsteins typically have large, knobby knees, but one of this boy’s was significantly larger than the other. I had to work that Saturday. My mom spent the entire day on the phone with different sanctuaries – none had room for this little guy. 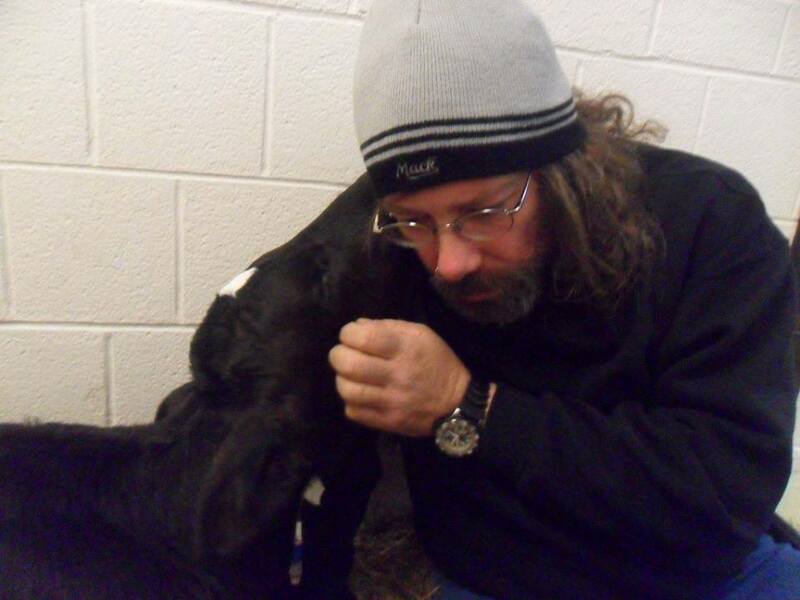 We had about given up hope when we got a call from Mike Stura, who said that he could foster the baby calf until he found him a permanent home. 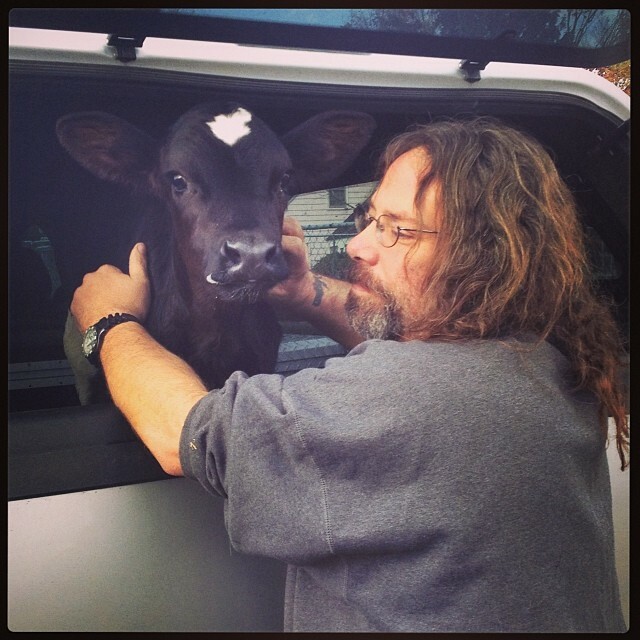 Mike and his wife, Wendy, made the long drive from their home in Jersey to New Fairfield, in their truck set up with hay for the baby, to Connecticut to rescue him. From the first time they met, Jimmy, named after Mike’s brother, looked to Mike as his daddy, and Mike returned the favor by fulfilling his promise to Jimmy – that he would be safe with him. Over this long, miserable winter, Mike made weekly visits to Cornell to visit Jimmy, who had to stay there while his knee was given the best treatment possible. He has already spent thousands of dollars to help get this little boy on the mend. So often, you scroll through your newsfeed and read different articles about animals in need. You think it’s awful, and you feel so guilty because you can’t do anything except maybe share the story yourself. Mike and Wendy are those people who, like the Ghostbusters, will get up in the middle of the night and drive to wherever an animal in need might be. They don’t ask for a lot of attention or help, they just do it out of the goodness of their hearts. If you can, please donate whatever you can to Mike and Wendy so that they can continue to do God’s work and save those without a voice who can’t fight back. They are truly two of the bravest, most generous people I have ever had the privilege to know.